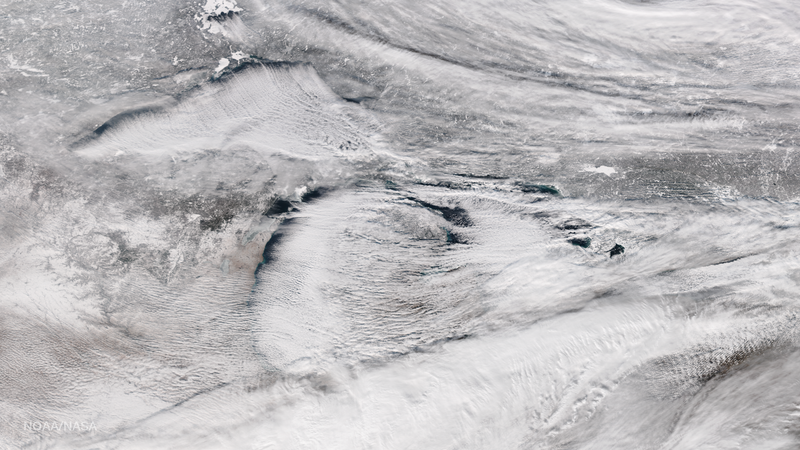 A stunning true-color satellite image taken yesterday shows the Great Lakes shrouded by lake-effect snow clouds. It’s a glorious example of this meteorological phenomenon in action. This image was captured by the Suomi NPP satellite, and it shows bands of lake-effect snow clouds as they drift eastward from the western Great Lakes. Parts of northern Ohio and New York state got hammered last night, receiving as much as nine inches of snow accumulation. Weather forecasters expect the snow to continue throughout today and into Saturday, dumping an additional nine inches of snow. Lake-effect snow happens when cold air passes over the warmer waters of a lake, causing some lake water to evaporate into the air and warm it. This warm, wet air rises, and then cools as it gets further away from the lake. During this cooling process, the moisture is released, and if it’s cold enough, it turns into snow. And as residents who live east of these giant lakes can attest, it can result in tremendous amounts of snow.